The Primary School Programme is designed to develop skills like critical thinking, problem solving, creativity, innovation and collaboration along with curricular competencies like literacy and numeracy. It is designed to encourage inquiry, exploration and cultivate natural curiosity. The Primary School curriculum is a blend of the Cambridge International Primary Programme (CIPP), Singapore curriculums and IB approaches. It offers an exciting and creative learning environment, with exploration of transdisciplinary themes. Teachers use a blend of inquiry-based and teacher- directed learning approaches to optimise learning. The learner-centric pedagogy is aimed to make students independent learners and encourage thinking & collaboration. Students learn Mathematics, English and Integrated Science. Hindi is taught as a second language, while French is offered as the third language. Apart from acquiring curricular competencies, students engage in investigations into various themes, using carefully planned lines of inquiries. A wide range of curricular & co-curricular opportunities are offered through a specially developed ‘Learning Enhancement Programme’. Students opt to be trained in two sports & three activities from a range of literary, music and drama activities on offer. This programme is designed to help students develop self-confidence, self-esteem and promote well-rounded development. Field trips, excursions, projects, etc., help making connections with real life situations by creating experiential learning opportunities. Reading activities increase students’ awareness of the world. Assemblies, concerts and drama productions help enhance their confidence. Students participate in community service programmes from Class III onwards, this helps in sensitising them to the needs of the community and the world around them. The programme includes visit to old-age homes, orphanages and blind schools to develop a better understanding of their situations and also to support underprivileged children. The Middle School Programme has been developed to build on the skills and competencies established in the Primary School Programme. 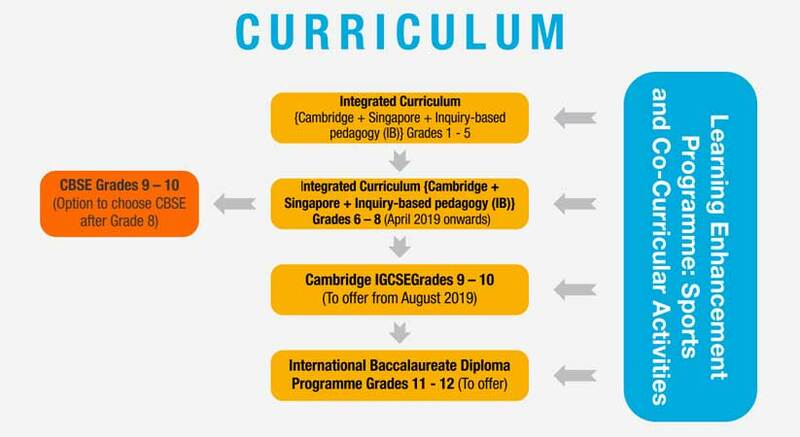 The curriculum is a blend of Cambridge Lower Secondary, Singapore curriculums and IB approaches. The curriculum has been optimised to create engaging learning experiences through an amalgamation of inquiry-based learning and teacher-directed learning to enhance understanding. With a focus on inter-disciplinary conceptual learning, students study English, Maths, Science, History & Geography and Global Perspective. Students will be able to choose languages to study from Hindi, French, Mandarin, German and Spanish. Students also opt for a range of sports, literary, music and drama activities from a wide range of curricular and co-curricular activities on offer in a specially developed ‘Learning Enhancement Programme’. This programme has been developed to help students develop self-confidence, self-esteem and promote all-round development. A litany of carefully curated field trips, excursions & community engagement programmes help in enriching educational experiences and raising awareness about the world the students live in. Inter-house competitions provide a healthy environment to test and hone their skills. Through participation in these activities, students learn vital lessons in leadership and team spirit. In the secondary school, students have an option to follow Cambridge IGCSE or CBSE curriculums. The IGCSE consists of a two-year syllabus, culminating in a public exam/board exam at the end of Year 10. Students are expected to take seven to nine subjects. A wide range of subjects offers students a holistic education in addition to keeping future career choices open. Choices are made bearing in mind the breadth of disciplines, possible career choices, aptitude and enjoyment. In addition, they provide excellent preparation for the International Baccalaureate Diploma Programme (IBDP) as well as other progression routes. The courses are developed in line with the changing needs, and are regularly updated & extended. IGCSE teachers can draw on excellent resources, training and advice from subject experts. In addition, students must also choose from a range of sports, literary, music and drama activities (curricular and co-curricular) on offer, in a specially developed ‘Learning Enhancement Programme’. This programme has been developed to help students develop self-confidence, self-esteem and promote all-round development. Widely regarded as one of the best pre-university courses in the world, the IBDP aims to develop students with excellent breadth and depth of knowledge. The inquiry-based pedagogy along with heavy focus on application, prepares students to flourish physically, intellectually and emotionally. The students will have many out-of-classroom activities and experiences, through Learning Enhancement Programme, such as theatre, photography, film review, Indian and western music, robotics, coding and sports like Golf, football, cricket, tennis, basketball & taekwondo, to name a few. Community service in an integral part of the curriculum. We believe that inculcating human values is essential for building ethically and morally sound individuals. Through a number of programmes under CAS, students are encouraged to understand the challenges faced by the less-privileged which sensitises them about the importance of being compassionate.